Note: A 3rd Edition of SimQuick is now available. Please go to SimQuick.net. Waiting lines (e.g., banks, fast-food restaurants, call centers). Inventory and supply chains (e.g., stores, warehouses, and simple combinations of these). Projects with uncertain task times. SimQuick requires no installation. It is just an Excel file. If you have a PC (stand-alone or networked) with Excel 2003 or later (under any version of Windows), or a recent Mac version of Excel, then you can immediately use SimQuick. 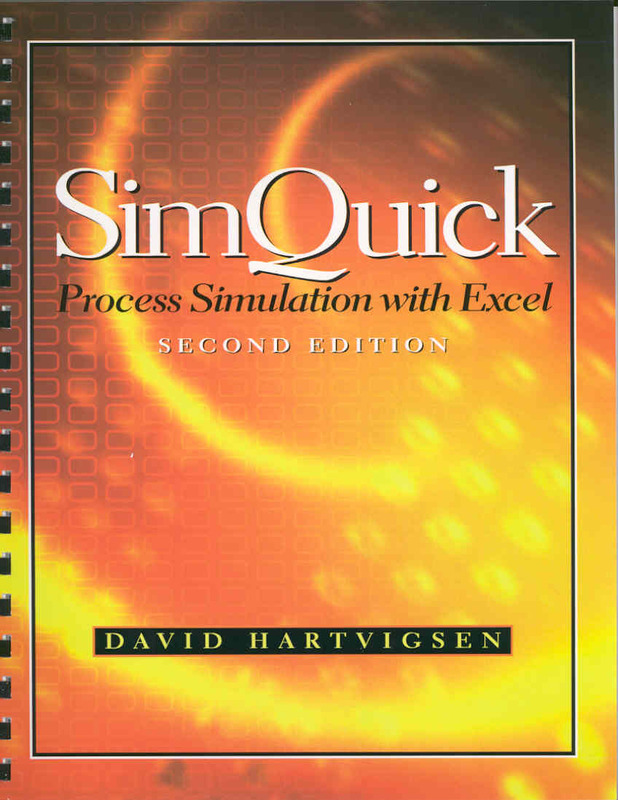 SimQuick is accompanied by a 115 page booklet (shown above) that introduces the technique of process simulation through realistic examples and exercises that utilize SimQuick. SimQuick is designed to be easy to learn and use: A wide variety of processes can be modeled after an hour of class time or independent reading. SimQuick has been used by a number of companies and by at least 40 colleges and universities, typically as a supplement to an Operations Management or Decision Science course. The SimQuick software with booklet currently costs about $20 per copy. Operations Management, Processes and Supply Chains, 10th Edition by L.J. Krajewski, L.P. Ritzman, and M.K. Malhotra; Prentice Hall, 2013. Successful Service Operations Management, 2nd Edition by R. Metters, K. King-Metters, M. Pullman, and S. Walton; Thomson, South-Western, 2006. Statistics, Data Analysis, & Decision Modeling, 5th Edition by J.R. Evans; Prentice Hall, 2013. Advanced Decision Support Tools by C.C. Bozarth; Prentice Hall, 2006. "... as a pedagogical tool for introducing the basics of simulation, SimQuick is an outstanding workbook and software package. A student with a basic understanding of Excel should be able to build and analyze simulation models with little to no help from the instructor." Security problems when opening SimQuick?